Most people that know me would call me…Thrifty. Aka Frugal. Aka Tightwad. When Aaron (fellow Three Thrifty Guy) was in college with me, he used to call me one of the cheapest guys he knew. I think I was suppose to take that as a compliment…right Aaron? :) Just like anyone else though…I like to see my dollars stretched. I hate having to pay a dime more for something, and home phone service is no different. For the past 4 1/2 years I’ve been with Vonage’s $24.99/month plan and have frankly been pretty pleased with the overall service. Unlimited phone calls. Good sound quality. Good voicemail features (text & mp3), and call forwarding options. Worked well for my family and I after we switched from Qwest’s limited local plan, which cost us $35/month in 2007. When I was with Qwest I got frustrated with the taxes, fees, government charges, etc. Before all that my bill was suppose to be around $25/month, but all the fees added up to $35! So when I settled on Vonage as my VOIP provider I thought I was getting a good deal in 2007. Unlimited phone calls for about $30/month, and a lot more features then I had with Qwest. Then slowly over the last 4 years my bill has slowly crept up. Always seemed like every month there was a few more new fees and more cents coming out. Last month I was paying $35.75/month. I was getting frustrated with this and I began seeing a lot of other people switching to cheaper options. That is when I started researching other home phone service providers. Here are the few legitimate options I found. Ooma – $199 to purchase the device from Amazon and you don’t have to get the premier package option ($10/month for the premier services), but $4.77/month for basic govt fees & 911 service. Allows porting over your old number too and allows 911 services calls. Got pretty high reviews on Amazon. Magicjack – $69.99 for the magicjack plus device. The new Magicjack has made a lot of improvements – in particular, it doesn’t require the device to be plugged into your computer. It too allows porting over your old number. Google Voice – Recently Google Voice started offering number porting, but only for mobile phones. There is a one time $20 fee for this service though. Offers you a lot of cool features which are well described in the FAQ’s. Skype – Currently offers a home phone adapter option for a one-time $64.99 fee. In addition, it allows unlimited calling to the US for 12 months and over 200 minutes on international calls. Currently number porting isn’t an option and 911 service can’t be provided. In looking at all these options I wanted one that seemed like the least amount of inconvenience to my family, had good reviews, allowed me to port over my number, and would reduce my monthly bill. With those criteria in mind I went with Ooma, mainly because of all the reviews I read online and some friends’ recommendations. With how many people online that had rated it 4.5 out of 5 stars I didn’t think 1861 people could be wrong. So just one day after ordering it showed up on my doorstep (one of the perks of Amazon Prime Memberships!). Immediately I was impressed with the look of it, and ease of registering it at Ooma.com, and getting my new phone service up and running. It took me a total of 15 minutes to get it up and running. After a few hours of testing it, I decided to port over my home phone services (a one time $39.99 fee). Just this past Thursday it was ported over (less than 2 weeks) and we were notified both my e-mail and phone call as to the status of our porting. The whole experience has been way better than I ever expected. Phone calls are crystal clear and it didn’t inconvenience my family for one second. The sweetest thing now is the monthly savings! Boom Goes the Dynamite! 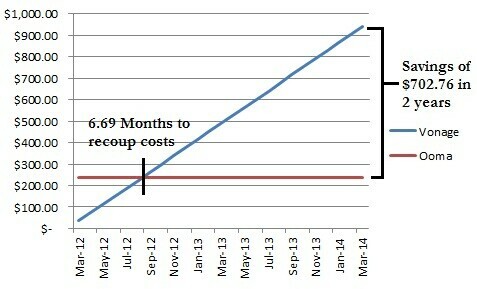 In writing this article I plotted out the cost difference and I didn’t realize how quickly the savings add up. In just over 6 months I’ll recoup my initial costs vs staying with Vonage for $35.75/month and in just two years I’ll save $702.76. I don’t know about you but $700+ back in my pocket sure excites me! Overall, I’d say we’ve been extremely pleased with the choice we made, and don’t regret it for a second. I’d be interested to hear what type of home phone service some of our readers use? What Do Wild Dogs Have In Common With Investing? Thanks Greg! I updated my content. @Glenn – No you don’t need to dial *99…it works directly by dialing the full number (like normal). Taxes and fees are NOW $4.77 a month. Mostly because of a local AND state 911 fee, or ooma states. @Ryan – You are right to point that out Ryan. 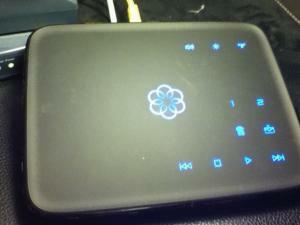 I discussed that with my wife last night the, “What if” Ooma goes out of business. That is why it’s worth calculating your breakeven point. So after 6.69 months then the rest of it is gravy. @Allison – Yes, Ooma does faxing services. I actually tested the faxing services with Aaron this weekend, and worked great! Can you send a fax using the services you listed? I’ve heard nothing but great reviews about Ooma. If I needed a home phone I’d go with them, hands down. It’s worth mentioning that Ooma might not be around forever. If they go under, you’re stuck with a useless $200 piece of equipment. Also, while using Ooma you have to pay $3 and change each month for government fees and taxes. Not much at all compared with traditional land lines though. Overall, a very small price to pay for a great service.